It was expected it was just a question of where! A very powerful magnitude 7.5 quake has rocked Papua New Guinea early Monday morning. Its depth was around 35 kilometres (22 miles), USGS said. 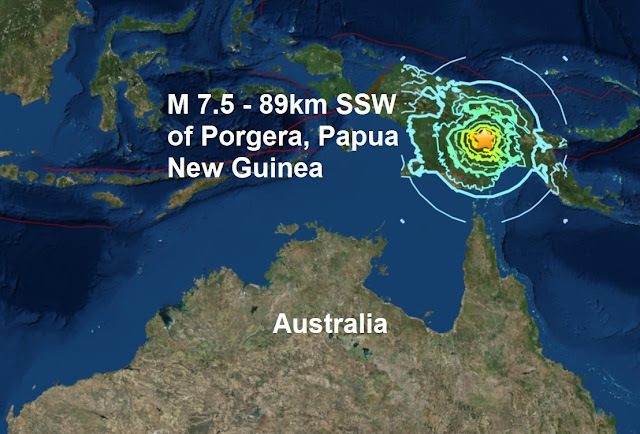 According to USGS, the tremor hit near the centre of the country’s main island, around 560 kilometres (348 miles) from the capital Port Moresby at around 0345 local time (1545 GMT). The Pacific Tsunami Warning Center said there was no risk of a tsunami in the aftermath of the tremor. Two days ago an enormous canyon-like hole (coronal hole) opened up in the Sun's atmosphere and once again a major quake has occurred during coronal activity. It's worth mentioning that of the 19 major quakes to hit our planet this year, 18 of them have occurred during coronal activity on the Sun and 15 of them has been around the very volatile Pacific Ring Of Fire. Today's major quake is the 7th of February.